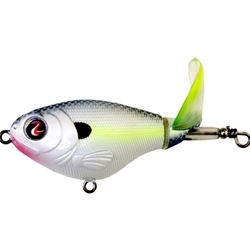 Whopper Plopper 75 /110 are the little brothers of the larger version, but don’t let its little package fool you, this bait has a serious little man’s complex. Built with the same durable construction as the rest of the line with Xtra Strong components including hook hangers, wires, and X-Strong size 4 treble hooks. This smaller version is made tough to battle bigger foes.